Luckily a few months later, I spotted something called Izze Esque, sitting close to the regular Izze sparkling juice I always craved but never bought. Izze Esque was all good news -- a 60 calorie (40 calories per 8 ounce) serving of the same kind of sparkling juice, made by the same company that cares so much about keeping its products all natural. After buying some, I found that I like Izze Esque just as much as I liked the full calorie Izze flavor. I'm not really sure how the Izze people pulled off the delicious taste without adding anything artificial, but they did! My favorite Izze Esque flavor is Sparkling Black Raspberry, but it also comes in Sparkling Mandarin and Sparkling Limon. All are just 60 calories (or 1 weight watchers point) per 12 oz bottle. 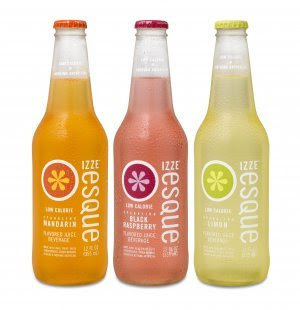 As I mentioned, I buy Izee Esque at Whole Foods, but according to the Izze product locator page, it is available in several other stores. If you are like me and you crave a sweet sparkling drink every once in a while, you should definitely check it out! If you can't spare the calories to drink Izze Esque, or would like to stick with 0 calorie drinks, you might want to check out my posting on making your own fruity water/drinking Hint.